The period between 1900 and the First World War could be called the Confident Years, the Buoyant Years, the Spirited Years, or named after some bright, hopeful color, like the Golden Years. It could be done, but such tags are the invention of pundits, social historians, and professional name coiners. 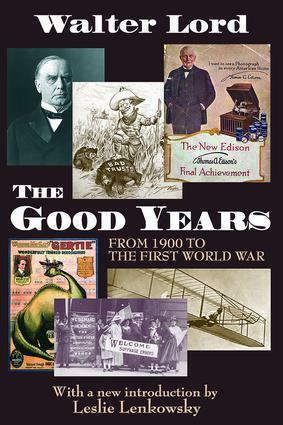 To the many varied people who lived through the era--the men and women who wistfully recall marching for suffrage, rebuilding San Francisco, or cheering wildly for Woodrow Wilson--the age was remembered as the Good Years. It was a time of triumph (the Wright brothers) and of tragedy (the Titanic). Days of wealth (a $200,000 ball) and of poverty (a child in a cotton mill earning $3.54 a week). But through it all ran an exciting thread of boundless confidence and hope. No one ever accused the people of that period of national indifference. It is this spirit of uncontested optimism, along with the pageant of great events, that makes this book such rewarding reading. In gathering his material, Walter Lord pored over letters, diaries, unpublished reminiscences, even Pinkerton reports, filled with fascinating and, until now, unknown detail. He traveled thousands of miles and interviewed the people who lived through the period. He met with individuals who firmly believed they had been given the greatest experience anyone could ever have; they knew and enjoyed the years when there was no limit to what we could and would do. Lord's attention to first-hand sources makes this book vivid and timeless. And Leslie Lenkowsky's new introduction adds contemporary dimension to this classic work.